Roads can be developed to favor both cars and non-motorized forms of transport. Photo courtesy of SGA Architects. The concept of transit-oriented development (TOD) as a planning tool is new to Indian cities, where quality mass rapid transit systems are relatively recent. The primary goal of transit-oriented development is to shift the auto-centric realm of urban living to a transit-centric realm of urban living. The main indicator of a city’s auto or transit orientation is the mode share – the proportion of daily trips made by private motorized vehicles in comparison to public and non-motorized transport. TOD interventions aim to significantly shift the mode share away from private motorized vehicles. Transit-oriented development has emerged in India in response to the poor air quality and congestion of the last decade. 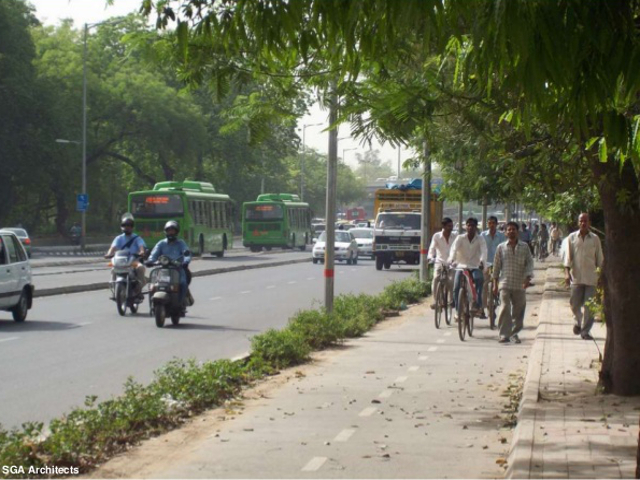 Delhi, in particular, is looking to TOD as a solution to its mobility and air quality issues. The city recently prepared a TOD policy document regarding the development of Delhi metro stations. TOD is being championed by Delhi’s Development Authority (UTTIPEC) as a solution to congestion, environmental degradation, and inequitable housing. TOD guidelines for Delhi indicate a desire to achieve a 70-30 modal share in favor of public transportation by 2021 (70% for public transport, 30% for individual vehicles). In comparison with cities around the world, Indian cities have a pretty good ratio of car trips to public transport. In Delhi, Bangalore, and Mumbai, less than 25% of trips were made by private motorized vehicles. Only Tokyo had a lower private transportation share at 12%. In many ways, Delhi already has a desired mode share with only 19% of tips made by private vehicles. Additionally, the Delhi metro ridership is at an all-time high at 2.4 million passengers a day. Indian metro systems need to focus their TOD policies if they aim to move the 25% of commuters that drive automobiles to public transit. The greatest potential for a significant shift would be in cities where private transit still dominates – Ahmedabad (42% private transport) and Bangalore (25% private transport) are good candidates. TOD strategies in Delhi and Mumbai would need to focus on making existing localities more inviting to non-motorized travel, while removing incentives for motorized vehicle ownership. Matching Station Area development capacity to the Mass transit carrying capacity. Matching the jobs and housing development capacity around transit stations, to the transit systems’s carrying capacity will help create a balanced system, avoiding increases in congestion by over-intensifying certain locations. Setting mix land use goals. Diverse land use is the cornerstone for pedestrian and transit-oriented communities. A benchmark for a desirable mix would measure existing transit-supported single-use neighborhoods and would aid them in changing over time to attain the desired mix without necessarily intensifying beyond an optimal density. Setting benchmarks for increasing cycle/rickshaw infrastructure. Rather than focusing on a private to public travel mode-shift, settings goals for increasing non-motorized modes could be more effective in changing travel habits. In many cities where proper investments are made in pedestrian/bicycle infrastructure, non-motorized transport increases significantly. Bogota, Copenhagen, Portland, and Curitiba are prime examples of this. Identifying TOD ready areas. Old, resettlement and traditional neighborhoods may already have ‘good bones’ for TOD, with good street connectivity, mixed-use and density. By adding transit connectivity, and minimal infrastructure interventions, they could become transit-oriented communities. Setting a benchmark for affordability along the corridor . One of the goals set by the Delhi Development Authority’s TOD policy is housing for all. Affordability in urban metros should include the cost of housing and transportation. If redevelopment of existing slums is part of a TOD project, the resettlement should account for both the cost of housing and transportation from the new housing to the existing job centers of the displaced residents. If the cost rises beyond an established benchmark, alternatives should be considered. These strategies, though not comprehensive, are crucial for making transit-oriented development successful in urban India. Setting benchmarks will provide targets that city planners and administrators can aim for when appraising policies or projects. Periodic, quantitative evaluation of TOD progress will help to ensure that the city is transformed into an equitable, multi-modal environment. Has the bus rapid transit tipping point arrived in India?